We had an earlyish start this morning as we had an exciting day in prospect. Kas had an earlier start than the rest of us, obviously, as she felt the need to go and run her way down to and back from a few of the local beaches first thing. The rest of us had barely surfaced when she came back, and we then began the fairly painful process of trying to get the kids moving after the late night yesterday. The “exciting day in prospect” was the boat trip we’d booked the previous day. It required us to be down at Albufeira Marina for 10 am, so we set off at 9:30, having not yet realised that it was only a 5 minute drive. So we had ample time to get parked up in the underground car park, which turned out to be free, and then to get checked in and have a coffee next door to take advantage of the boat company’s 15% discount (cough!). OK, the coffee was reasonably priced rather than extortionate, but I’m not so sure about the “discount” business. The waiters were well practised in ensuring that you got your drinks and your bill in sufficient time to catch your boat though. The general gist of the boat ride is that the coastline here is remarkably pretty, and you can get a much better sense of that if you’re just out to sea rather than just on the land. The coast in this area is formed by the meeting of smallish, rolling limestone hills with the sea. The overall effect is that the limestone forms near vertical cliffs, many of which are being undercut by the formation of caves. Where the land is lower and where caves have already collapsed then you get a series of small bays, each of which has its own pristine little beach, with a cafe and a (bad) car park. The part between Albufeira and Gale Beach is really pretty. Then you get to a not-so-nice stretch from Gale Beach over to the other side of Armação de Pêra, which is your more traditional vast-expanse-of-sand-with-dunes-behind sort of beach, formed where a barrier beach has formed (or has been formed, possibly) in front of the wetlands at the mouth of the Ribeira de Alcantarilha. From the sea it doesn’t look so nice. Neither does Armação de Pêra, which looks for all the world like a tightly packed collection of apartment blocks conveniently stuck next to a beach. I suppose that’s what it is, to be honest. It doesn’t look particularly filled with character, unless the character you want it to be filled with is Rab C. Nesbitt. Maybe I’m being a bit snobbish. Oooh ! Get me ! Once you get past there you’re back into the pretty bits of coastline again. The trip took us nearly all the way over to Carvoeiro, and this stretch was much the prettiest. One of the best bits was a rock in the water which was used apparently by The Beatles as the inspiration for their Yellow Submarine animation. If you’re not familiar with the animation and someone tells you this, you’re likely to believe it. But if you then compare pictures of it to the actual animation, it’s not a great resemblance. It does look like a submarine, and the rocks are yellow, but it doesn’t look like the Beatles Yellow Submarine, if you see what I mean. On the way back home again the boat made a brief stop so people could jump off the back and have a bit of a swim. It was only for 15 minutes, which suited me because I’m not a fan of open water swimming, but was not as much as expected, and was maybe a bit disappointing for those who thought they were “getting a swim”. Kas and Ami both jumped into the cold water with gusto and had a good old splash around. Izzy was a bit more tentative, but would probably have gone in had it not been for the boatman telling her it was cold, and also hinting it was more or less time to pack up and go home. She got her feet wet. The way home was quite uneventful, especially for Izzy, who used the relative quiet to catch up on some zzzzzzzzzzzzz’s. When we got back we had a late lunch at a different cafe beside the marina (different from the one where we’d had coffee earlier), and then Kas dropped me off at the far end of Gale Beach so I could go and do a bit of caching, while she and the girls did some shopping for tea and then retired to the villa for some pool time. I walked from the far end of Gale Beach grabbing a few caches, I passed the one cache we’d done on saturday when we arrived, and continued my way on to through an excellent series of caches along the coastal path, nearly all of which I gave a favourite point to. I found 11 in total and spent the last hour or so in and around the very lovely Evaristo Beach – there was some backwards and forwards action here, as I stopped for a drink, realised I’d missed one cache (because it was off the coastal path), then returned to the beach to grab the final one of the series, and then calculated the bonus cache to be back behind the beach where I’d just been. It was a nice enough area though, and it had the distinct advantage of being only a few hundred metres away from the villa. As I was walking back up I noticed a text from Kas asking if I could stop to buy matches, as she’d done a great job of provisioning us for an evening barbeque except for forgetting matches. I found a little tourist tat shop on the main street which didn’t sell matches but did sell little touristy cigarette lighters for €1 each. When I got back I had time for a quick dip in the pool. Izzy was getting quite brave in there. Soon we dragged everyone out to get cleaned up before cooking the evening barbeque. When we do barbeques overseas we generally always manage to palm the girls off with local sausages (so long as they have plenty of ketchup), and Kas had bought some chicken kebabs too. The sausages were really nice, and it turned out Kas had also tried out the other nearby supermarket (not the Spar we’d used before), and discovered it to be a much better experience. Still small, but with a much better selection and seemingly cheaper prices. And a nice meat counter. You can’t beat a decent meat counter. 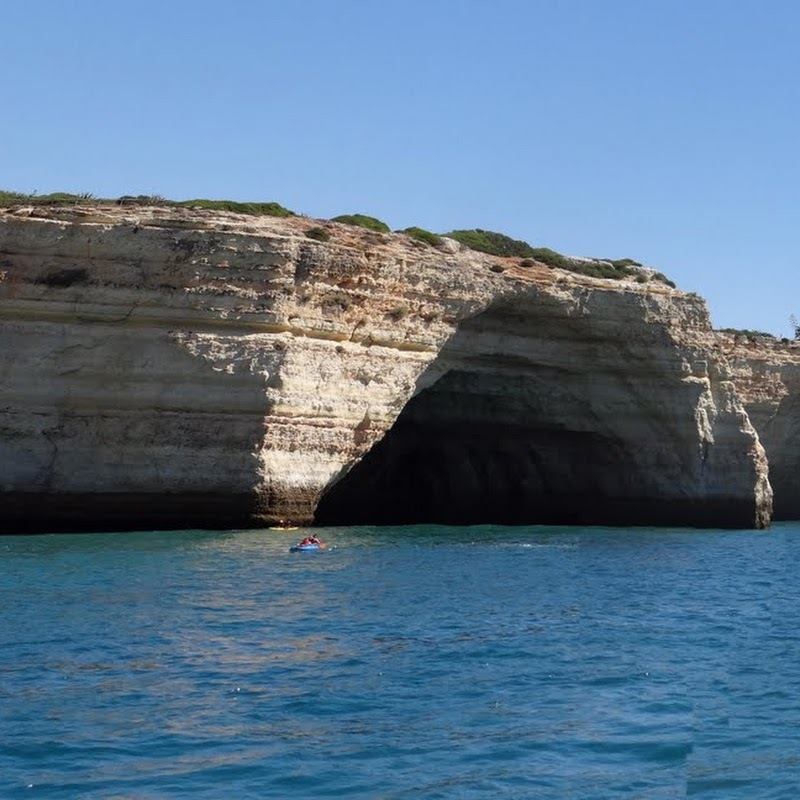 The boat trip had taken us to some very pretty locations that we wouldn’t have seen from the land, so it was worthy from that perspective, and it also had the advantage that being on a boat out at sea was somewhat cooler than sitting in a windless enclosed space on the land. A jolly good day was had by all. And the follownig day we discovered the cleaner had cleaned all the ashes out of the barbeque too, saving us a job.